There are days I get the opportunity to do things I think I cannot do. Yesterday was one of those days. Some friends talked me into running 16 icy, snowy, beautiful miles at Letchworth Park. It's the longest I've run in a while and it felt pretty great. ﻿﻿I wasn't planning on going to this run. Honestly, I thought it sounded kind of crazy. 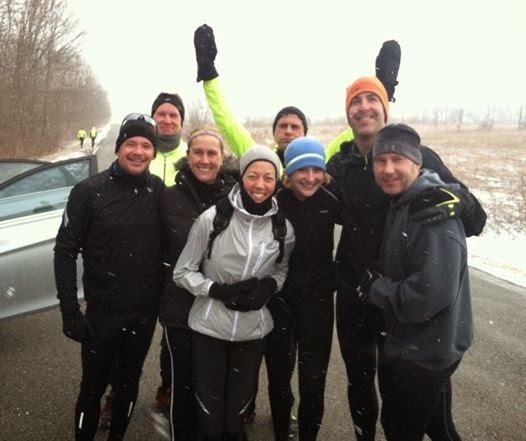 The crew was going to run the Sehgahunda preview run (12 miles) and add on 4 more miles on the roads. After running about 6 miles with Danielle and her friend Saturday morning on the Crescent trail (and I use the term running loosely, since some parts of the trail were so icy we were doing more hiking than running), I decided that Letchworth was a no-go. I don't like running trails in the winter, I really don't like running on ice and I already got in my obligatory fall this winter, so I figured attempting Letchworth would be an exercise in calamity. But then I got an invitation from Pete, and it's really hard to say no to his positive peer pressure, especially when he offered up a ride from Steven and his tricked out car. So then I was in. Okay, I thought, I'll go and just run 6 miles, maybe 12 if I'm lucky and I feel good, but definitely not 16. 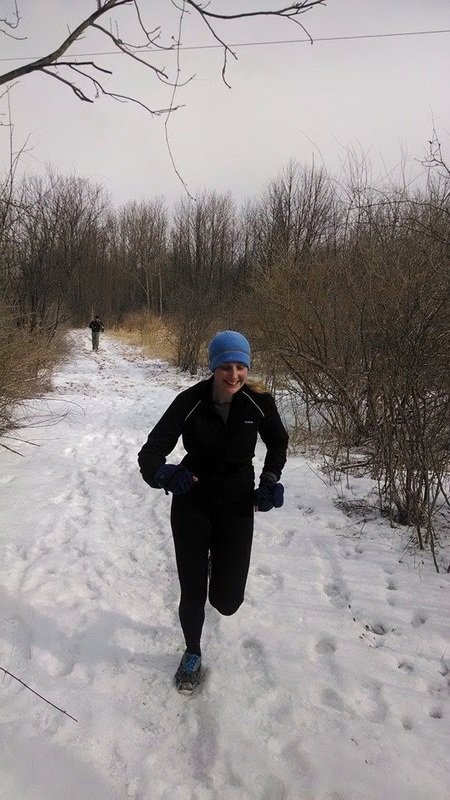 Luckily I had brought my spikes and Alison had convinced me to wear them, because the trails were thick with ice and snow, windy and cold in spots. Even in the best conditions, I am terrible at trail running. Picture an elephant trying to do ballet. It's like that, only worse. (Though the elephant does have a really big smile on its face.) The first six miles, I tried to relax and just go with it, following Pete and copying all his moves at the creek crossings. A light snow was falling in some spots and it was really quite beautiful. I felt strangely content and at peace. I say strangely because usually on trails, The Doubts get in the way and I feel nervous. Someone had brought a dog, who was running back and forth herding us, like our own little doggy Sherpa. I loved it. Thanks to Alison for this photo. Once we got to the road and stashed our spikes in Jenn's Car of Fun, we headed out for 4 miles (2 miles out and 2 miles back to the car). It was very windy and cold on the roads, but my feet felt so much better without the spikes on that I didn't care. When we got back to the car, I was so tempted to call it a day. But after a quick break to pee in the woods (where apparently I got some burs in my thigh. I only realized it after the run when I was changing my pants and wondered why my leg was bleeding) and put my spikes back on, I was back on the trail for another 6 miles back to the start. The spikes were really hurting my toes by this point. At mile 14, I took them off but then I was sliding all over the place so I put them back on, figuring some temporary pain was better than a potentially ruinous fall. I was starting to feel a little fatigue, but no muscle cramps or anything, so I was thrilled about that. (Today I read something about how during runs over 2 hours you need to take some protein with your fuel, so I will try that next time. I've been running for 18 years but I still learn something new every time.) I'm still surprised I was able to do all 16 miles and 3 hours of running and feel so good afterwards. I was stiff yesterday, but after breakfast with the group (at a restaurant whose name I can't remember, but I do know there was a bear statue nearby. I made a mental note to go climb on that sometime), Batman band-aids for the bur-induced scrapes on my thighs (any day you have Bruce Wayne between your legs is...no, I just can't do it. It's too easy), extra sleep last night and yoga stretches for my hips and legs this morning, I feel fine. This is a glaring reminder to myself to say yes more often. Had I stayed home and run on my own yesterday, I wouldn't have had nearly as much fun or felt as awesome about it. Lyric of the moment: "A friend in need's a friend indeed. A friend with weed electrolyte tabs is better..."
Great story! Glad you made it! Love the lyric of the moment!